The Perl Maven site was based on the Perl Dancer web framework, more specifically on Dancer, the first major version of the framework. Leave Dancer and Write it based on plain PSGI/Plack. Abandon Dancer and write in it some other framework such as Mojolicious or Catalyst. I decided to try to migrate to Dancer 2. This article is (going to be) both a diary of the process, and hopefully a helping guide to others who would like to make similar migration. Before we go on, let's first see why leave Dancer 1, and why try to migrate to Dancer 2 instead of any of the other options outlined above? 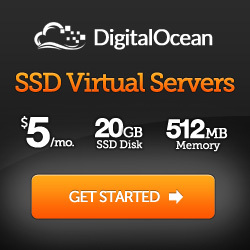 Why Migrate to Dancer 2 ? In the last couple of days I have spent an enormous time trying to get Dancer do something that it probably cannot do. Specifically I wanted to create sessions and set cookies conditionally so I can avoid creating thousands of sessions for each request of each bot visiting the site. (If sessions are enabled, Dancer will create a session just because the template() function is called to render a page. I asked about this and the answer was that it probably will not be changed in Dancer 1. (Which is OK, they don't want to break backward compatibility and they don't want to spend a lot of time on the maintenance version of Dancer.) I tried to enable/disable sessions on the fly, but apparently it does not work with the Plack::Builder deployment example explained here. I have not even reported this issue because I assume they won't want to work much on the now maintenance version of Dancer. Another thing I wanted to do is to configure the session_domain based on the current request and some configuration option. Dancer, by default, sets the cookie for the exact hostname of the request so visiting ru.perlmaven.com and br.perlmaven.com would (and used to) yield two cookies. I could change this by setting the session_domain option in the configuration file, but as I want to make the application available to host other sites as well, I wanted this to be configured on-the-fly. I could not do this either. I could try to delve into the source code of Dancer 1 to try to fix these, but do I really want to invest my time and energy in that? Would they even accept fixes for these issues? I have not seen a lot of Development on Dancer 1 recently, it seems that most of the effort goes into Dancer 2. So I arrived at the conclusion that I need to abandon Dancer 1 and find an alternative. I could rewrite the application in raw PSGI/Plack. I have been using it for the search.cpan.org cloning project and in another project. It is fun, but as I could see from these projects I have been reinventing certain parts of Dancer. Specifically, I already had a template() function and a route dispatcher which also acted as both a "before" and "after" hook. This is all fine, but why reinvent the wheel? Will my solution be better? Well, maybe it won't have the same bugs as Dancer has, but I am sure I'll have plenty of other bugs. After all, Dancer has been developed by many people each one of them being a better programmer than I am. Even if that was not true, the fact that it has been used by a lot of people means it has been field-tested by many people. So using raw PSGI/Plack might be a small step forward, but it will also be a big step backward. Switching to either Mojolicious or Catalyst would required a major rewrite, and neither of those seem to be more appealing to me than Dancer. In my perception, Catalyst is too big for this application, and Mojolicious feels like a moving target. It might be fun, but I want to spend my time on serving my customers and not running after the changes in the framework I use. This would certainly be a very good option. Maybe this would require the smallest additional work from me, but because Dancer 1 is in maintenance mode it will be probably harder to get changes in the code-base, and there will be fewer people willing to improve it. Most importantly, it feels like a waste of time. Eventually the core Dancer developers will all move to Dancer 2 and I will either use an abandoned version of the framework, or will have to migrate to Dancer 2 anyway. 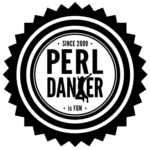 While I hear encouraging words from Sawyer and the 2014 Perl Dancer Advent calendar is full of optimism with Dancer 2, I have not actually seen any application written in Dancer 2 yet, and I have not heard about any company that have migrated to Dancer 2 either. I am sure there will be issues. Probably a lot more issues than Dancer has currently, but it is being developed. So probably, if I report the bugs, they will be fixed much sooner than bugs in Dancer 1. Even if others don't fix it, it will feel much better to invest time in improving the next version of Dancer, than the previous one. So that's it. I am going to start the migration to Dancer 2, and I'll record my process here. I am not sure if this is the best process to do it, and if you follow it you might fall in the same pitfalls I did, or you might avoid them because you see my mistakes. In any case, I'd also recommend looking at Dancer2::Manual::Migration, the migration document that comes with Dancer 2. It has some good advice and if it is missing some information, you can always as on the Dancer mailing list. The very first thing was to create a branch called dancer2 in the GitHub repository of the project. I'll use that branch for the migration, and I can still make progress with the application while the migration stabilizes. I'll keep rebasing it to master as I make progress. The next thing I did was replacing the Dancer requirements by Dancer2 requirements in the Makefile.PL of the project and installing the modules. Besides Dancer, the only Dancer-related plug I have been using was the Dancer::Plugin::Passphrase. So I changed Dancer to Dancer2 in both of these names and tried to install the respective modules. I managed to install Dancer2 without any problems, but installing Dancer2::Plugin::Passphrase failed. I have reported it here, but the response was basically to wait. Not a good start, but this does not need to totally stop me. I might be able to migrate other parts of the system, faking that module while I wait for it to be fixed. Update: within two days the module was fixed, I could install it on both OSX and Linux. Because of this failure, I have commented out the requirement for Dancer2::Plugin::Passphrase. As I have been using Travis-CI to provide continuous integration for the Perl-Maven code-base, I could use that as place to see which parts of the code-base need to be updated. So I pushed out the first change and got the first failure report from Travis-CI. Not so surprisingly, the main (or even the only?) complaint was the missing of the Dancer module, when trying to load the application in various tests scripts. in the Perl::Maven::Admin, Perl::Maven::PayPal, and Perl::Maven::WebTools modules. In addition, there was a use of the Dancer::Template::TemplateToolkit module. the actual use might not be necessary any more, but for now, I've replaced it with the used of the Dancer2 version of the same module. As I can understand from the migration guide, there is no more need for the ':syntax' part. In addition, because the Dancer2::Plugin::Passphrase could not be installed yet, I've created a module called Fake, that will mock the behavior of the passphrase function. Luckily the API of that function was very simple. Having this fake version of it will allow me to continue with the migration process and see if I encounter other problems, even before the Passphrase issue is fixed. then I ran the tests and also committed the changes to see what Travis-CI will tell us. Update: the Dancer2::Plugin::Passphrase module was fixed and I could get rid of the Fake.pm. Nevertheless I left it here in case you encounter a similar situation with another module. Engine 'template_toolkit' is not supported. In order to understand what's going on, I created two applications using the dancer -a and the dancer2 -a commands and compared the configuration files. That was enough to get started. The start_tag and end_tag it used were the same as in the simple template <% and %> respectively. That still does not seem to be enough. As my experiments showed, the default start_tag and end_tag are now [% and %], (these are the same that Template::Toolkit really uses as defaults), but we have <% and %> so we need to change the start_tag and end_tag values. I committed the changes here, but by that time I got the report from Travis-CI and it showed the problem there is still the missing Dancer.pm module. Now I started to wonder where else is it loaded that the tests fail. It wasn't difficult to find them using ack 'use Dancer'. Three of the tests scripts load it directly using use Dancer qw(:tests);. This tells Perl::Critic, to accept having use Moo, or use Dancer instead of having use strict; and use warnings;. That's correct, because use Dancer; indeed loads both the strict and warnings pragma. The same is true for use Dancer2 so we also need to tell Perl::Critic to stop complaining. I added Dancer2 in the list of equivalent_modules for both entries. With that noise out of the way it is much easier to focus on the real issues. Which is still having use Dancer in some places as the Travis report shows. There is no need to add :tests to the use-statement of Dancer2 and it imports both the set and the config keywords so I don't need to prefix them any more. (I listed them after the use-statement of Dancer2 in comments just to make it easier for a reader to locate the source of these keywords.) Finally, the PSGI application created by Dancer 2 is not returned directly from Dancer2, instead of Dancer::Handler. This is actually a well known and painful issue with Perl. The problem was that the behavior of request->referer and request->user_agent has changed. If they did not have a proper value, in Dancer 1 they always returned undef. Both in scalar context and in list context. In Dancer 2 the behavior changed. In scalar context they still return undef, but in list context they return an empty list. In the above code, the right-hand-side of the fat-comma operator (=>) creates list context. This means that the empty lists were squashed, and the value of the 'referer' key became the string 'ip'. Which had a cascading effect and the content of $ip became the next key which contains the . characters the exception was about. Depending on the response to that bug report I might have to update the code later and maybe I'll need to check my whole application. I can say that it was actually lucky this happened during the migration process and not only in the production code. In the public/ directory of the project there were 4 files that I think are not used by the Perl Maven application: 404.html, 500.html, dispatch.cgi and dispatch.fcgi. I don't need to migrate them, but because the scripts load Dancer, I thought it would be better to get rid of them. So I temporarily switched back to the master branch of the Git repository. Removed these 4 files there. Ran the tests of the Dancer 1 version of the application and committed the changes. Then I switched back to the dancer2 branch of the repository and rebased the branch to the new master using git rebase master. It does not load Dancer (nor Dancer2) and so it should have use strict; use warnings;. Not only to satisfy Perl::Critic, but also to save us from some stupid mistake down the road when we might add some code to this script. It is also now recommended to change @INC to a relative directory, and finally, instead of calling the exported dance function, now we call the dance method. Hook error: Can't use an undefined value as a HASH reference at /Users/gabor/work/Perl-Maven/bin/../lib/Perl/Maven.pm line 202. at /Users/gabor/perl5/perlbrew/perls/perl-5.20.1_WITH_THREADS/lib/site_perl/5.20.1/Dancer2/Core/Role/Hookable.pm line 141. It seems the source of this problem is a change how from_yaml behaves, but I am not sure if the change in the behavior was intentional and I need to update my code, or if is a bug in Dancer. I asked it both on the mailing list and as a bug report. This was an intentional change so instead of using from_yaml, I changed my code to use the YAML::Load function. This issue took the longest time to fix. I think I wasted on it more than 2 days and to be honest I still don't understand the problem. When I want to return a file (e.g. to let the user download a pdf file, but even in the development environment I am using Dancer to server images) I use the send_file function provided by Dancer. Because the files are not located under the public directory of Dancer, I also need to add system_path => 1. Thing that drove me crazy that this featured worked in the Dancer 1 version and also all the tests passed. It also worked in the Dancer 2 version when I launched the application using perl bin/app.pl but it failed when I run the unit tests!!!! For days I was experimenting trying to find out the source of this problem. I think the issue was that the path to the file that I wanted to server was relative to the root of the application. In the tests of Dancer 1 this still worked but for some reason in Dancer 2 it did not server these files. Finally, after tearing out some of my remaining hear, the solution was to convert all the path-es to be absolute path-es. I made this change on the 'mater' branch that was still using Dancer 1, in order to make sure that version works properly with this new code, and then rebased the 'dancer2' branch to include this change. After Dancer2::Plugin::Passphrase has been fixed and I could install it, the system still did not work. At first I did not know what the issue was, but after trying to print the result of the passphrase($password)->generate slowly I understood. Earlier, the generate method of Dancer::Plugin::Passphrase returned an object that when printed would stringify to the value I had to save in the database. The documentation recommended I should store the string returned by passphrase($password)->generate->rfc2307, but it also provided the convenience of stringification. The Dancer2 version of this module does not stringify (which might, or might not be a bug), but I have no choice, but to work with the explicit call to rfc2307. I think this make the code clearer, so I don't mind. First I implemented this change too on the master branch using Dancer 1 and rebased the dancer2 branch. With the above change I've finished migrating from Dancer 1 to Dancer 2. All the tests are passing on my development machine and Travis-CI has also confirmed it. When I launch the application using perl bin/app.pl it seems to work properly. The only thing remains is to deploy the new version and to hope I have not overlooked something critical. This worked well in Dancer 1 as this regex only matched the beginning of the path. See my post to the Dancer mailing list. 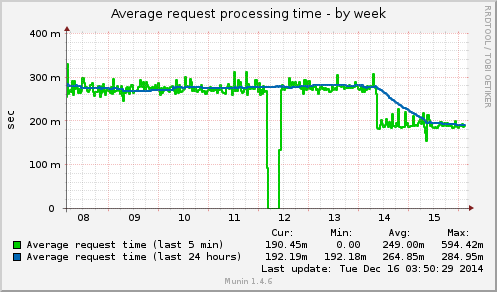 Finally let me show you the graph I get from Munin showing the average request processing time on the Perl Maven site. I switched the site over to use Dancer 2 on the 13th in the evening hours. The green line, showing the average time for the previous 5 minutes, immediately fell from about 285 ms to 192 and the blue line, that shows the average of the last 24 hours, joined it after 24 hours. In a nutshell: a performance increase of (285-192)/285 = 32%. When creating a session, by default both Dancer 1 and Dancer 2, set the cookie to be used for the exact hostname being served. This means when someone visits br.perlmaven.com that person will get a cookie for br.perlmaven.com and when that same person visits perlmaven.com, the system will set another cookie and thus a separate session. In order to have a single cookie and a single session, one needs to make sure the cookie is for .perlmaven.com (note the leading dot).